Aprecie as vistas e sons de Seattle a partir de Elliot Bay e Seattle Harbor neste cruzeiro narrado de 1 hora. Saiba mais sobre a zona histórica de Seattle e veja de perto um dos maiores terminais marítimos do mundo. Aprecie a vista do horizonte da cidade com um espetacular cenário panorâmico das montanhas Cascade e Olympic, incluindo o majestoso Mt Rainier. Alimentos e bebidas estão disponíveis para compra a bordo do navio. Partida do Pier 55, no Central Waterfront de Seattle. Este é o cruzeiro turístico de Seattle que começou tudo. Desde 1949, este cruzeiro pelo porto narrado tem sido uma atração favorita de milhões de pessoas, tanto visitantes de longe quanto de locais. Aproveite esta excursão turística de 1 hora pela orla histórica de Seattle, com vistas aparentemente intermináveis do horizonte da cidade, a roda-gigante Great Wheel, Space Needle, as cadeias de montanhas Olympic e Cascade e Mt Rainier, é claro. O navio normalmente possui um convés inferior fechado com um deck superior aberto, certificado para 250 viajantes, mas geralmente acomodando entre 75-150 convidados. My experience was better than expected. I thought it would be cold and I would get seasick. Neither happened. My mom and sister visited from out of town and they too enjoyed the tour. We took the Puget Sounder train from Lakewood and walked from King Station to pier 55 and boarded. My mom is 79 and had no difficulty making it. 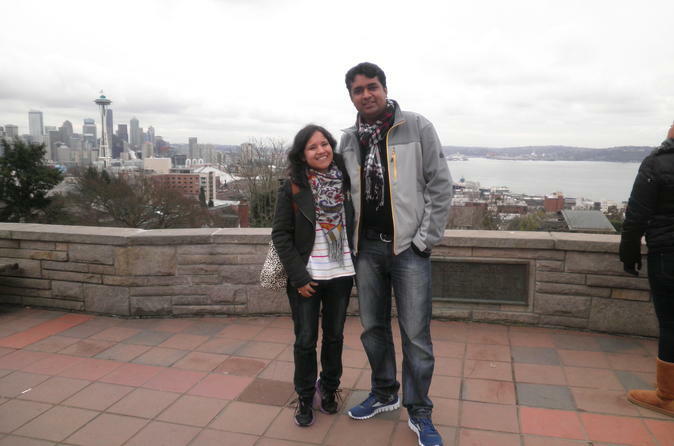 This was a great place to see Seattle with Mt. Rainier, Cascade Mountains and Olympia Mountains in the background. Seeing sea lions, Space Needle, Mariners and Seahawks stadiums, Olympic park, cargo ship industry and other cool things in the city made this one hour cruise very worthwhile. 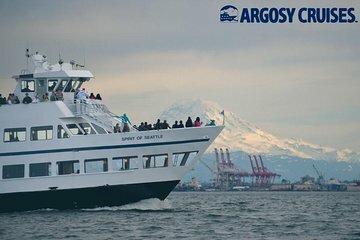 Argosy cruises and staff added to cruise experience. Fun and learned something! The sound is incredibly beautiful and the guide was knowledgeable and entertaining- really enjoyed this! Great introduction to the city. Took the recommendation from another reviewer to do this first and they were right. Tour provides history and provides information about the city and things to do. Wasn't two long, good narrator of what we were passing. Weather was overcast but still enjoyable - need to sit on the right side of the boat to see the shoreline but those of us on the left got a spectacular view of the mountains. Informative and calm cruise ride. View of the Seattle downtown is so amazing and the sunset moment is so breathtaking to witness. We enjoyed every moment of this tour. Overall this trip was a great price and well worth our time. Thanks Everyone on the tour team for making our time that much better! The tour and the guide both were what I expected, very good. A hint to improve the overall experience: Once you pay online, having the receipt and voucher already on you phone, you should be able to enter the boat with your phone instead of having to get the tickets and wait in line twice. Very interesting and relaxing. Beautiful sites.